Ok, all you people who say you can’t get a challenge card done in 1 week – for this challenge, you have 2 weeks! I think this is an awesome sketch; you can use just about any stamp set you want, you get to create a textured background, and use some Designer Series Paper! Oops – don’t forget some bling! Honestly, I was trying to think of something ‘different’ for the main focal area – and I thought of Hallowe’en, which is coming up soon. 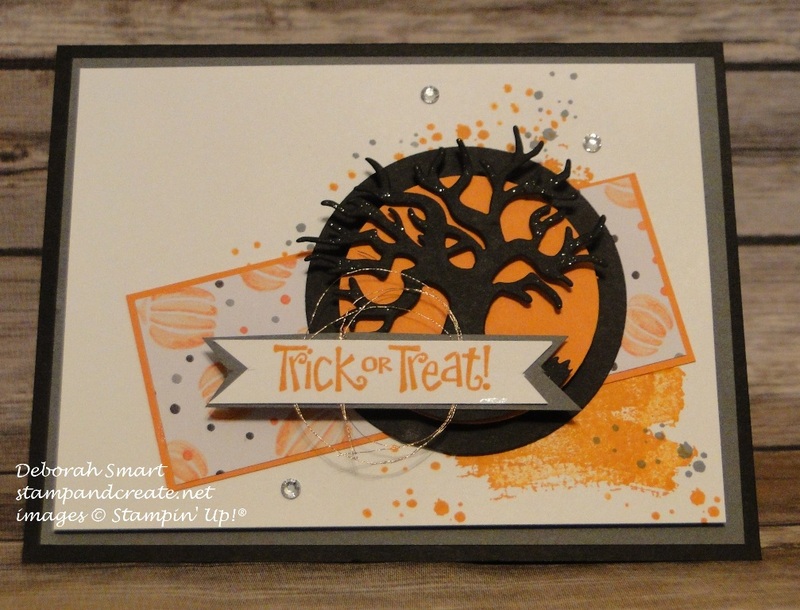 I’ve been having fun playing with the Hallowe’en Scenes Edgelits Dies (you can see another card using them in this post HERE), and since they were still on my desk…. I started with a card base of Basic Black cardstock, then added a panel of Basic Gray. On the panel of Whisper White, I used the Work of Art stamp set and the smaller brushstroke image and stamped it several times in Pumpkin Pie ink. I then added some splatters in Basic Gray and Pumpkin Pie ink. 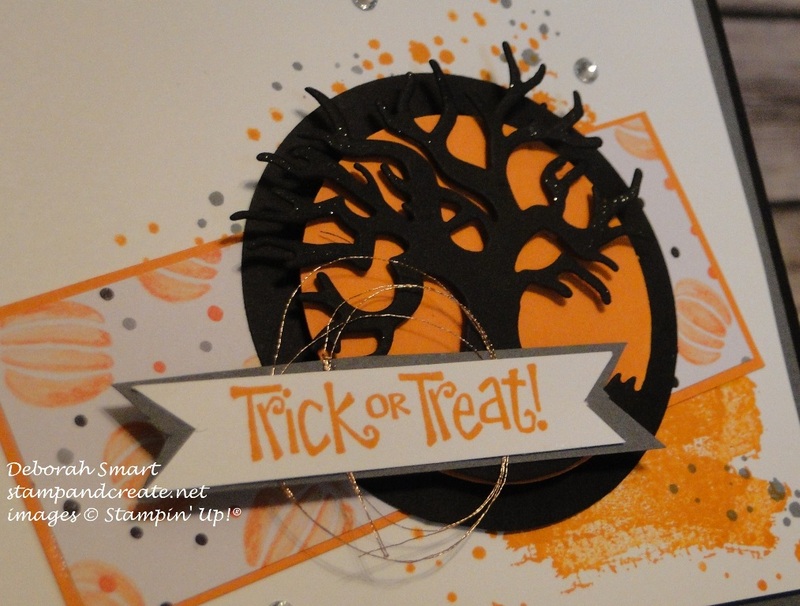 I die cut the tree using the Big Shot and the Hallowe’en Scenes Edgelits from Basic Black cardstock, and attached it to a circle of Pumpkin Pie cardstock, punched using the 2″ Circle Punch. I then used the (retired) 2 3/4″ Circle Punch for a Basic Black layer, and attached it underneath. I used my Clear Wink of Stella pen to add some sparkle to the tops of the tree branches. For the panel under the tree, I layered a piece of the Hallowe’en Night Specialty Designer Series Paper over a panel of Pumpkin Pie cardstock, and used Tombow liquid glue to attach it to the stamped panel, then attached the tree using Stampin’ Dimensionals. The sentiment is from a retired stamp set, inked in Pumpkin pie, and layered over Basic Gray cardstock. I used my Paper Snips to cut the banner tails on both ends, and attached some loops of the Gold Metallic Thread behind the sentiment before attaching it to the card. A few Rhinestone Basic Jewels, and the card was done! You’re right, Deborah. It does look great! What a fun card.